For other questions about OUR PRODUCTS, please click here. If you would like to learn more about the NATURAL INGREDIENTS that we use in our products, we also have a small list here. If you can't find the answer to your question or concern, please feel free to contact us and we'll be glad to help you out. You can order online through our Shopping Cart. Drop by any of our Human Nature Branches in your local area to shop and enjoy free-flowing coffee while you wait for your orders to be rung up and neatly wrapped. Make your shopping more personal! Share natural beauty, makeup, and body care tips and advocacy news whenever you order from a Human Nature Dealer near you. You can phone in your orders at our Head Office through (02) 784-7777 (M-F 9am to 6pm & Sat 9am to 1pm, GMT+8). Metro Gaisano Metro Alabang | Market! Market! Bank Deposit (Gandang Kalikasan Inc., BPI Current Account No. 3101-0986-12 or BDO Account No. 0022-1034-4383) - Please pay for your purchase within 7 days and email us ( orders@humanheartnature.com) or fax us (02-784-7751) a copy of the deposit slip so we can process your order. Please remember to include your name, order number, and phone number so we know who you are! We accept online and mobile fund transfers. Interbank fund transfers are possible, however, processing charges are automatically deducted. Kindly ensure that the amount of fund transfer covers the whole amount of the order including the charges. Credit Card (MasterCard/Visa) - Your credit card and identity information are protected on our site by Comodo Secure. PayPal (Payments are made to paypal@humanheartnature.com) - From our checkout page, you will be redirected to the PayPal site to process your payment. Can you process secure credit card payments? When ordering over the phone or via email and when reporting changes in credit card details, we strongly recommend that you call us at (02) 784-7777 instead of emailing your credit card details to ensure confidential and secure transactions. For online orders, all you need to do is type in your card details in the payment section of the checkout page. Our website complies with the highest global standards of security and is regularly tested for vulnerabilities by Comodo Secure. Is it safe to place my orders online? Yes, it's safe. Our website is protected with robust hardware and software security systems and is regularly tested for vulnerabilities by Comodo Secure, to ensure that your account information and payments are kept secure. We want the absolute best product experience for all of our customers. If for any reason (any reason at all!) you're not satisfied with your purchase, just return it to the place of purchase or get in touch with our Customer Service Team within 30 days for non-food products and 7 days for food products from the date you bought it. We will provide you a replacement, refund, or credit for it - absolutely. We're here to serve you Mondays to Fridays, 9am-6pm and on Saturdays, 9am-1pm, GMT+8. What's the shipping cost in the Philippines? Metro Manila: Shipping is FREE for orders from Head Office above P2,000! For orders worth P2,000 and below, the fee is an unbeatable fixed rate of Php50! Alternatively, if you are outside Metro Manila, you may find it more convenient to contact our branch in your local area. After your payment is confirmed, we'll select the most convenient and quickest courier for your area. Your order will arrive neatly wrapped and sealed in our specially designed Human Nature box via our partner courier service. Normal shipping time is 1-2 business days for Metro Manila addresses and 2-3 business days to provincial addresses. Can you deliver a gift for me? Yes, we can! You can opt to have your invoice shipped with your order, or just emailed to you if you're sending it to a friend as a gift. If you're ordering via phone, just inform our sales representative whether or not you'd like the invoice to be sent with your order. On the checkout page, at Step 1: Shipping & Billing Info, select or add the address of the person to whom you wish to send your gift. Select the checkbox: "Do not include invoice please." You can leave your default billing address as is. Continue with your checkout process as usual, and we'll ship your gift for you, hassle-free! What do I do if a product that I want to order is sold out? Don't fret, we accept back orders for sold out products. Just place an order as you usually would via phone or the online store, and we will ship it to you as soon as the product/s come back in stock. The available products in your order will be delivered immediately as usual, and the great news is, shipping is free for the separate delivery of back orders! What do I do if there's a missing or incorrect item in my order? As soon as you notice something amiss with your order, simply report it to the branch where you purchased your products or to our Customer Service hotline (02) 784-7788, within 24 hours of your purchase. We will speedily investigate and replace the item/s at no additional cost. To avoid undue inconvenience for you, we encourage you to check your purchase at the counter before leaving the store. For delivered goods, kindly check your items as soon as you receive them. How do I add items to/change/cancel my web order? All order revisions can be coursed through our Sales Team at orders@humanheartnature.com or (02) 784-7777 as long as the order has not been processed for ship out. Any changes in the web order will reflect on the invoice but will not reflect on the system-generated order confirmation email. What should I do if my web payment did not go through? You may choose to resubmit your order or manually send payment. For credit card payment, we recommend you to give us a call at (02) 784-7777 instead of sending the details via email. This is to ensure the safety of your credit card details. Alternatively, we are happy to call you. Just email us back with a number where we can reach you and your preferred call time. You may contact our Customer Service Team at customer.service@humanheartnature.com or (02) 784-7788. How much will it cost when you ship internationally? The international shipping fee is based on FedEx rates, and is computed based on the weight of the package and the destination. Please note that we charge in Philippine Pesos (Php), so there may be slight differences depending on the fee your credit card charges for foreign currency transactions. International orders may be subject to import duties and/or taxes, which are levied once your package reaches that country. Human Nature ships your package DDU (duties and taxes unpaid). When it delivers the package, FedEx will collect from the recipient any import duties and/or taxes levied by the country's customs agency. You may also be required to submit additional documents for customs compliance, which we will inform you about via email prior to finalizing your order. For more information regarding a specific country's custom policies, please contact that country’s customs office. Help! I can't access my shopping cart account! Don't panic! If you forgot your password, just go to our shopping cart homepage, click "Login" on the menu at the upper right side of the page, then click "Forgot Your Password". You will be asked for your registered email address, and we will send you a new password to your email. If you still cannot access your account, just call us at (02)784-7788 so that we can assist you personally. It's easy! First read our Terms to understand the earning program and learn more about doing the business. Choose your size of sample pack: either P799 for a 15% starting discount or P1,999 for a 25% starting discount. Register online or you may also download, print, and fill out our Member Registration Form. You may submit your filled-out form and a copy of your valid ID to your nearest Human Nature Branch and pay for and claim your sample pack & dealer ID there. Or you can fax your form along with a copy of your valid ID to (02) 784-7751, or scan then email it to trade@humanheartnature.com. We will then get in touch with you for the payment and delivery details. How do I know my Dealer ID number? After you successfully register as a Human Nature Dealer, you will receive your Dealer ID with your unique Dealer ID number. If you have not yet received your ID, or if you have lost your ID, please just get in touch with the branch you registered with (if you registered online, contact the Head Office at (02) 784-7777 / (02) 784-7788. You can also see your dealer ID number on the lower right of the invoices of your purchases, just below the total payment and across your name. Can I use my discount if I don't have my dealer ID yet? No worries! All you have to do is present a valid ID, and we will honor your dealer discount. Help! I lost my discount. How do I reactivate? If you have been previously purchasing products with a discount but are now purchasing at a lower discount level or at full price, it's possible that you have not met the required monthly purchase requirement for three months. Don't worry, it's easy to reinstate your discount. You can reactivate by making a one-time purchase of at least P800 at dealer price or a cumulative purchase of at least P 800 within one month at SRP (full price) to get back your 15% discount, or you can make a one-time purchase of at least P1,500 at dealer price or a cumulative purchase of at least P1,500 within one month at SRP (full price) to get back your 25% discount. Pro Tip:If you're ordering over the phone, just tell our sales representative that you're making the purchase to reinstate your discount. If you're ordering online, just write in the comment box at the bottom of the checkout page that your purchase is for the reinstatement of your member or dealer status. This is so we can advise you how much you still need to fulfill your minimum monthly purchase requirement. How can I activate my dealer discount online? We'll take care of setting up your online account! Simply contact our Head Office at (02) 784-7788 or email customer.service@humanheartnature.com so that we can activate your online shopping account with the correct discount for you. Your discount does not automatically apply until we activate your account, so make sure you get in touch! As soon as your account is activated, you can start shopping! Great news - for Metro Manila deliveries from Head Office, shipping is FREE for orders above P2,000! For orders worth P2,000 and below, the fee is an unbeatable fixed rate of Php50! Table rates apply to orders outside Metro Manila. How do I access my dealer dashboard? If you are registered and you still haven't received your online password, simply email customer.service@humanheartnature.com to request a password to your account. How do I refer people to register as dealers? Make sure your prospective referral puts in your name and ID in the “Who introduced you to Human Nature” field in the registration form, and we'll take care of listing him/her under your account. How do I earn income from my referrals? Dealers from Bronze to Diamond rank are entitled to earn referral income from their dealer and end user referrals provided that they are able to meet the required personal purchases and community purchases required per calendar month. The detailed dealer earning structure with sample computations may be found in the Terms. Can I earn from my non-dealer referrals? Yes, you can earn from referring first-time Human Nature shoppers. Just make sure to provide your referrals with your Dealer ID and full name and remind them to inform us that you referred them. You can learn more about our referral structure in the Terms. Can I purchase products from any branch in the Philippines? Yes, you may! The great thing about this is that your member/dealer discount applies at every Human Nature branch. Just note that we update our dealers' account information nationwide at the start of each month, so if you're aware that your discount level has changed, all you need to do is ask the branch you're shopping at to check your current discount level with your home branch. How do I check my personal and referrals' purchases? Just log in to your Dashboard to check your purchases and your referrals' purchases throughout each month. Referral income based on your dealer rank are released every third week of the succeeding month. For example, for your sales for the month of June, commissions will be available on the third week of July. How can I be included in your online dealer directory (Find A Dealer) page? If you're a Human Nature Dealer of Silver Level or above, you may be included in the directory. Just email customer.service@humanheartnature.com with your request to be included, plus your full name, contact details, and website (if any) that you want to be displayed on the directory page. Can membership be transferred to a family member? Memberships may be transferred to family members if the principal dealer passes away. 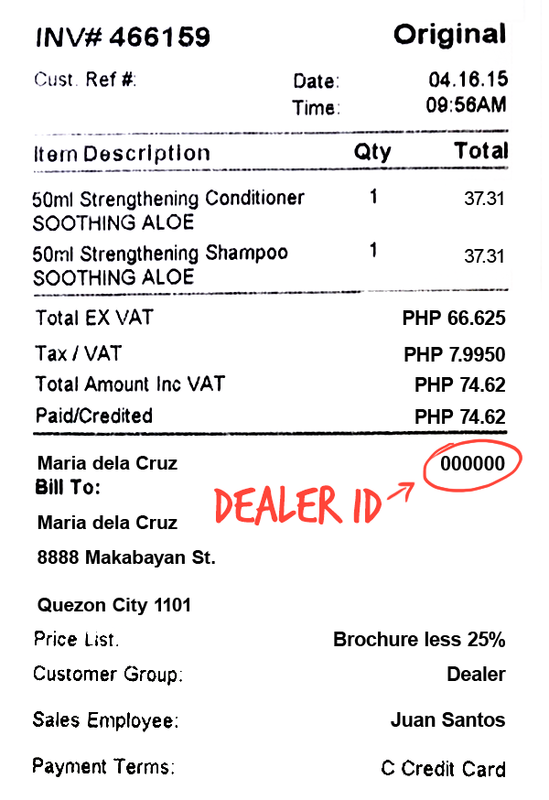 In this case, you just need to submit a filled-out registration form and a valid ID (as if you were applying as a new dealer) plus the old Dealer ID to your branch. This will then be attached to the original registration form. If the death certificate is available, kindly provide the branch with a copy as well. You will not need to pay for a registration pack anymore. You will also be using the same Dealer ID number. May I put your products and tarps on display in my store? Yes, you may. Just secure permission first from the Head Office through the Branch Operations Team. Call (02) 784-7788 to inquire. May I use your product images in my online promotions? Yes, you may, as long as you credit Human Nature as the source of the images by linking back to our website (www.humanheartnature.com). For online promotions, make sure to put a disclaimer that it is a dealer-initiated promo on your promo page. What are the requirements in putting up a branch? You can call us at the Head Office for information at (02) 784-7788 or kindly send an email with your request for requirements to robert.gomez@humanheartnature.com. For information on international wholesale, click here. Can I sell Human Nature products outside the Philippines? To apply, please fill out our International Wholesale Form and we'll contact you within three business days. I'd like to open my Online Dealer Shop. What are the requirements and where can I learn more about it? Your rank should at least be Dealer (25% discount) and you must be currently active with a web account. You can find out more in our Online Dealer Shop FAQ. What communities do you work with? Human Nature works with citronella farmers in Brgy. San Jose, Impalutao, and Imbayao in Bukidnon, with the lemongrass farmers in Cauayan, Negros Occidental, with the VCO farmers in GK Immaculate Concepcion Village in Iloilo, with the soybean test plots and the passion fruit and sunflower test plots in GK Pueblo Antonio Village in Catigan, Davao City. We are building and developing partnerships with more farming communities every year! How may I visit the Enchanted Farm/communities of Human Nature? You may get in touch with GK Enchanted Farm for a scheduled visit by sending them an email at info@gkenchantedfarm.com, or connect with them via Facebook and Twitter. Why are your products much cheaper than other natural products? Human Nature is a social enterprise. Our affordable prices have been achieved because we made a decision to greatly reduce the usual profit margins. Our ingredients are the same as those in much higher priced brands. But most of us can only make the choice to buy what is good for us and good for the environment if the price of natural products drops dramatically. We also do not incur the high costs of advertising and costly retail stores allowing us to pass on our savings to the consumers. Rather than trying to maximize profits like most businesses, we aim to optimize them, considering what is best for our country and our people, especially the poor, in all our decisions.